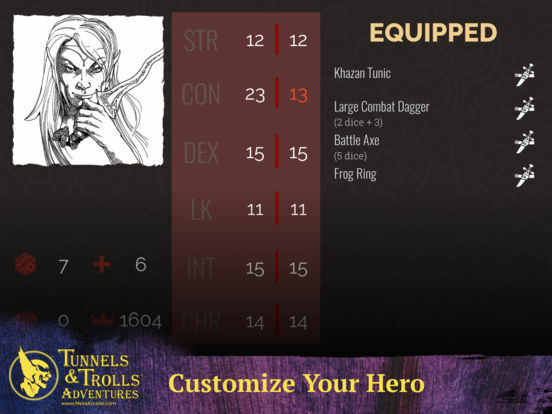 I wanted to create a separate post to talk about stuff I'd like to see in the Tunnels and Trolls Adventures app. First off - a shop. You end up getting a bunch of loot during your adventures but nowhere to spend it. Potions and rations that increase your Con wouldn't go amiss here. Magic. Currently you can only create warriors, which makes it simple to run a solo - wizard solos tend to require a magic matrix, which could be a bit fiddly, I guess. But the option to be a wizard or rogue would add some depth to the game. Talents. While the T&T rules are fairly open with talent selection, selecting from a list to get a bonus shouldn't be difficult to implement and means that characters aren't similar. I suppose the only annoying thing for MetaArcade would be to programme where each talent can be used. Illkin. Yeah, maybe it'll unbalance the (pretty unbalanced) game, but let me be a minotaur already!